The Stinger's long hood and short overhang give it a sporty sedan look. 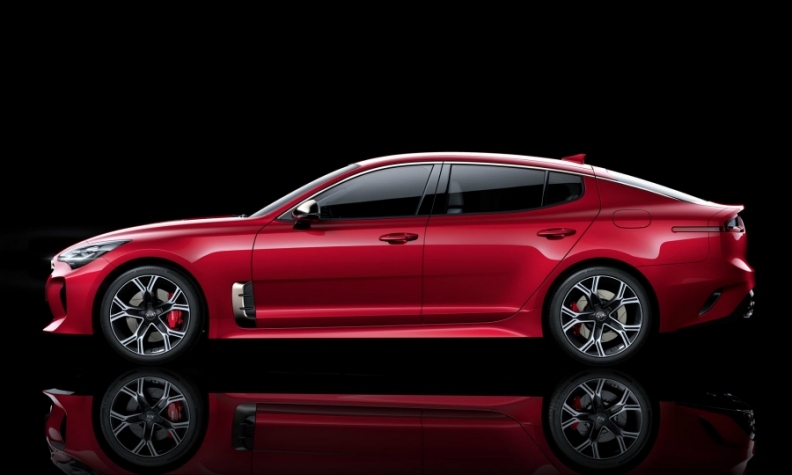 FRANKFURT -- Kia will launch its Stinger four-door fastback in Europe in the fourth quarter. Kia hopes the Stinger will serve as a halo model for the brand and has been pushing the car with a marketing campaign that shows the model racing around the Nurburgring race track in Germany. The Stinger, which debuted at the Detroit auto show earlier this month, sits on a new rear-wheel-drive platform that it shares with parent Hyundai Motor's upcoming Genesis G70 model. The architecture provides the Stinger with an extended wheelbase of 2905mm, which allows the car a long hood and a short front overhang. The car is 4830mm long and 1870mm wide, which Kia says allows for a more spacious cabin than many other similarly-sized sports rivals. 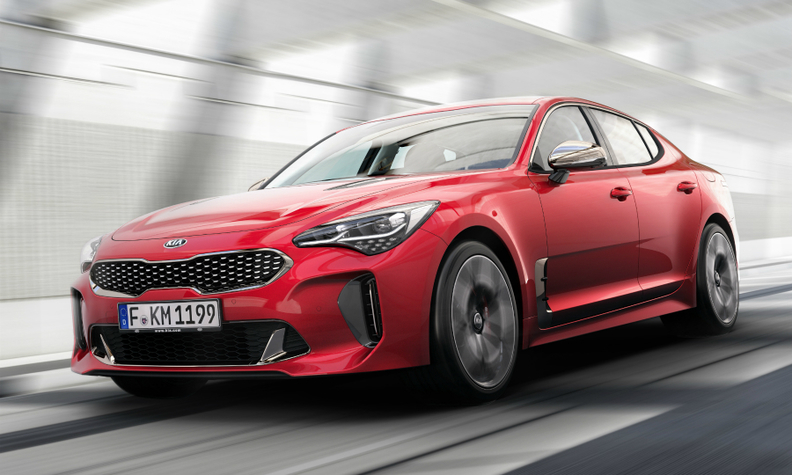 The Stinger will have rear-wheel-drive with a mechanical limited-slip differential as standard, while all-wheel-drive with brake-induced torque vectoring will be optional, making it the first Kia to offer both. The Stinger's fastback silhouette is similar to Audi's A5 and A7 models. The car will be the first Kia model to offer a driver attention alert system that helps to combat tired or distracted driving. In Europe, driver fatigue is believed to account for a quarter of all fatal traffic accidents, Kia said, while in the U.S., authorities have estimated that 1,550 deaths and 71,000 injuries are due to loss of concentration through drowsiness. Kia plans to offer three engines in Europe; a 2.2-liter four-cylinder turbodiesel producing 202 hp, a 2.0-liter turbocharged four-cylinder gasoline unit making 255 hp and a 3.3-liter turbocharged V-6 gasoline engine that will produce 370 hp and accelerate the car from 0 to 100 kph (62 mph) in 5.1 seconds. Its top speed is 270 kph (168 mph). The 3.3-liter variant will be Kia's fastest production car to date. The Stinger will be available with Kia's eight-speed automatic transmission with paddle shifters. The car has a more aggressive variant of the current Kia front design. The Stinger has a more aggressive variant of the current Kia front design, but the styling of the car's rear end has a distinctly Italian look, with triangular tail lamps mounted high in the corners and two oval tailpipes at each corner of the bumper that lend the sedan a muscular look. 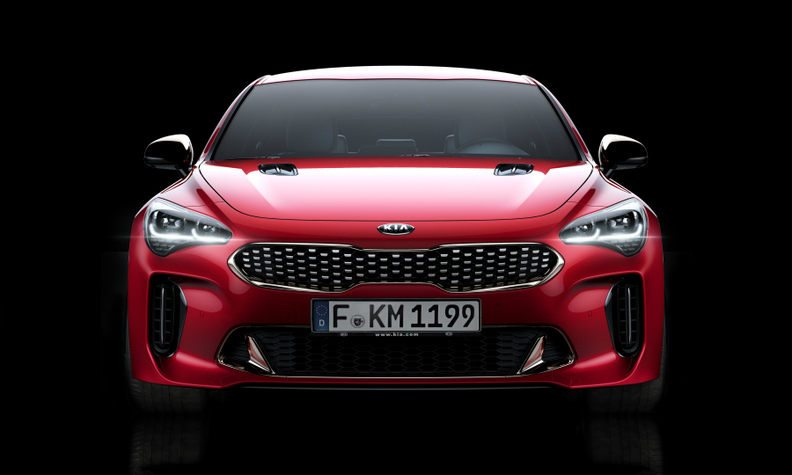 The Stinger was styled at Kia's European design studio in Frankfurt, under the control of Kia's global design chief Peter Schreyer, and his European counterpart, Gregory Guillaume. The Stinger has a fastback silhouette similar to Audi's A5 and A7 and, as well as drawing on the GT concept, which was revealed at the Frankfurt auto show in 2011. It borrows design details and its name from the GT4 Stinger concept, first shown at the Detroit auto show in 2014.